One of the ironies of the Blue Streak saga is that the UK spent a very considerable sum on its development and on the Europa satellite launcher as part of ELDO, sums of the order of £200 million at 1950s/1960s prices, with absolutely nothing to show for it at the end of it all. However, over a period of around 15 years from 1957 onwards, designs and proposals for an indigenous satellite launcher based on Blue Streak came and went. The design which most nearly came to fruition was known inelegantly in official files as the Blue Streak Satellite Launch Vehicle, or BSSLV for short. This chapter looks at the various designs proposed over the years. Not surprisingly, since Blue Streak, Black Knight and Black Arrow were the only liquid fuel ballistic rockets being developed by the UK, most of the designs tended to revolve around these vehicles, but in addition liquid hydrogen stages were often proposed. Alternative HTP designs could have been produced from de Havilland’s Spectre or Armstrong Siddeley’s Stentor motors, but were never considered by the RAE or Saunders Roe, where most of the designs originated. The design of Blue Streak was finalised by around the start of 1957. At the same time, Black Knight had been set in motion, and it might be useful to give some approximate data for each vehicle. launcher, however mismatched they might be. This might be less efficient, but it saved time and money. But to step back for a moment, the origins of the BSSLV are both obscure and interesting. It is well known that the Pentagon was interested in reconnaissance from satellites in the mid-1950s, but was held back by a legal consideration. Aircraft from one country could not overfly another country without permission – to do so would be violating the second country’s airspace. What had not yet been legally established is the height of a country’s airspace – did it end at the top of the atmosphere or stretch out to infinite space? And how would ‘top of the atmosphere’ be defined? Thus one of the reasons why the satellite proposed as part of the 1957 International Geophysical Year would be launched by a civilian rocket was so that it could not be described as military in nature by the Soviet Union. Its purpose would be entirely scientific, but at the same time it would set a legal precedent. For comparison, the GDP of the UK in 1967 was $111 billion. But it was not only America that was interested in reconnaissance. So was Britain. Desmond King-Hele of the Guided Weapons Department, RAE, was given the task of writing a report outlining the advantages and disadvantages of reconnaissance by satellite. RAE GW reports are usually very prosaic documents, designed to convey technical information only. It comes as something of a surprise, therefore, to read King-Hele’s introduction to his paper2. Escaping from the earth, this ‘dim vast vale of tears’, has long been one of man’s recurrent dreams, a dream enshrined in primitive myth and exploited in many later European writings, among them Dante’s famous Divina Commedia, which includes visits to all the known planets, the sphere of the fixed stars, and beyond, even to the empyrean. Neither Dante nor most of his successors could specify a realistic means of propulsion, and it is only since the advent of the modern rocket motor the dream has shown any possibility of being fulfilled. Now that plans are afoot in Britain for a long-range ballistic rocket missile, the first step towards fulfilment – an unmanned satellite circling the Earth – has advanced beyond a possibility to a logical development. The equally recurrent military need for continual reconnaissance also appears to be satisfied by a satellite vehicle, provided its launching is not denounced as a warlike act. If launched in high or middle latitudes it will inevitably pass over enemy as well as friendly territory, and much better photographs should be obtained from a satellite than from high altitude aircraft ‘peeping over the frontier’ through hundreds of miles of haze. Bringing the satellite safely back to earth would be almost as difficult as placing it in an orbit; so the satellite is here assumed to be expendable, i. e., it is doomed at best to die in a brief blaze of glory, lighting up the night sky to the wonderment of some remote tribe, and at worst to drop with dull thuds in recognisable pieces on an enemy city. Some of his rhetorical flourishes are not entirely successful: ‘to drop with dull thuds’ strikes a note of surely unintentional bathos, and political correctness today might cause ‘the wonderment of some remote tribe’ to be reconsidered. After this rather ornate introduction, the prose becomes more mundane and more suited to the matter under consideration. The problems as he saw them were firstly, providing adequate propulsion and structure without exceeding the stringent limits on weight; secondly, methods of guidance, control and power generation; and thirdly, recording and transmitting back to Earth a picture of interesting territory which the satellite passes over. King-Hele was aware that the satellite would not be able to provide ‘live’ data that is, when it was above the territory to be photographed, it would not be able to relay the information back directly, as the receiving station would be over the horizon and thus out of radio contact. What is slightly more surprising is that he rejected the idea of recovering film directly from the satellite after re-entry on the grounds that atmospheric decay of the orbit would be too unpredictable. The possibility of commanded re-entry did not seem to have been considered at all. A continuous strip record would be taken while over interesting territory, by infra­red photography. This record would be processed or otherwise stored until transmission back to the ground, which would take place over friendly territory at low data rate. For an orbital altitude of 200 nautical miles quite good resolution, 100-200 ft, should be obtainable with a camera of about 50" focal length, and a strip 40-50 miles could be covered. A third and more direct method is the Bell solar battery, in which electricity is generated directly by light falling on thin strips of pure silicon impregnated with traces of boron. The first models of the solar battery had an output of about six watts of exposed surface but by improved techniques output has now been raised to about 11 watts (11% efficiency of conversion). The standard 2000 lb satellite assumed here has a surface area of about 150 sq ft, so the area requirements are within the realms of possibility. The present high cost of the Bell device (quoted elsewhere as around half a million dollars per kilowatt) would however have to be reduced. It will obviously be advisable to profit as far as possible from work on the Blue Streak surface-to-surface ballistic rocket missile, and accordingly the type of propulsion and structure at present proposed for Blue Streak are used here. That is a remarkably accurate prediction, made all the more impressive since the two vehicles in question were still in existence only on the drawing board! King-Hele’s proposal can be seen in Figure 54. Looking at the design more closely reveals that the 3 ft diameter Black Knight sits uneasily on the 10 ft diameter Blue Streak. Making a one ton satellite that would fit into a 3 ft payload fairing might also be a challenge (for comparison purposes, the average saloon car is about a ton in weight). SECOND STAGE (a* BLACK KNIGHT) WEIGHT I237G LB. LENGTH 30 FT.
FIRST STAGE (a* BLUE STREAK) WEIGHT 203,132 LB. LENGTH 62 FT. In 1957, there was also considerable security surrounding both Blue Streak and Black Knight, and it was not until 1959 that Geoffrey Pardoe of de Havilland was able to present various satellite launcher designs, using the same ideas, to a meeting of the British Interplanetary Society (BIS). The design that emerged as the favourite perhaps took the answer to the geometry problem a little too far: instead of being a slim 3 ft cylinder, the upper stage had become a 10 ft sphere!4 There is considerable logic behind this design, but there was also a practical difficulty relating to cost and facilities, which was much less obvious. Saunders Roe had designed their test facility at High Down for a 3 ft diameter vehicle; the stands could be relatively easily adapted for designs up to 54 inches Beyond that, there would, apparently, have to be considerable rebuilding. The cost of this was held up as an objection to design after design, until Black Arrow with its two metre diameter lower stage was produced – without any objection from anyone! Mr. Longden reported that de Havilland had been doing satellite performance estimates. He understood that using only Blue Streak and Black Knight they could get a ton into orbit. Mr. Cornford said that this work should not be encouraged. Figure 55. Pardoe’s design for a Blue Streak launcher. 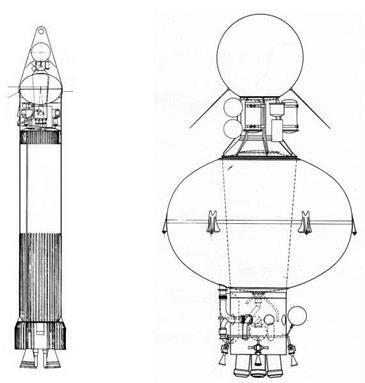 The complete vehicle is shown on the left; the somewhat unusual second stage is shown in enlargement on the right. Unfortunately, the minutes give no explanation as to why! In May 1959, Harold Macmillan was asked in the House of Commons by Mr Richard Fort (Conservative Member for Clitheroe; sadly, he was to die in a car accident four days later): ‘if he is yet in a position to make a statement about space research’. Meanwhile, however, design studies are also being put in hand for the adaptation of the British military rockets which are now under development. This will put us in a position, should we decide to do so, to make an all-British effort. I have asked my noble Friend, the Lord President of the Council, in consultation with my Right Hon. Friend the Minister of Supply and other Ministers concerned, to exercise general supervision of these new developments. I cannot give any figure of the cost of using the British rocket should it be decided to do so. What we are doing now is to spend a substantial but modest sum, more in hundreds of thousands than in millions, first for the design of the instruments, which is the first element, and secondly, for making the necessary designs for modifications of the British military rocket should it be decided when the time comes to use it for this purpose. Mr. Chetwynd [Labour member for Stockton-on-Tees]: Is the Prime Minister satisfied that there is intrinsic value in this scientific work or is it just an attempt to keep up with the Joneses? I am not by nature or, I am afraid, by education very favourably inclined to swallow all that the scientists tell me, because, alas, I do not understand it, but I am impressed by the universal opinion of these very distinguished people whom we have consulted, and I feel certain that in this scientific instrument work it is clear that Britain ought to play her part in this advancing scientific effort. As to the method of launching these instruments, what I felt right to do, and what, I think, the House will think sensible, is to make preliminary work at not very large expense which will put us in a position to use our own rocket should, when the time comes, we decide to do so. As a result of the announcement, Dr Robert Cockburn (who at that time was CGWL) at the Ministry of Supply was asked for design studies for a rocket and for the satellite itself by the Office of Lord President of the Council, Lord Hailsham, who was also acting as Minister for Science6. The RAE set up a series of panels to produce a detailed design late in 1959, resulting in the brochure produced by Saunders Roe, entitled ‘Black Prince’. It was obvious that Saunders Roe had been involved before the announcement had been made. In a meeting back in April, ‘Saunders Roe tabled and presented several schemes for RAE consideration and discussion’. As a result of all this work, a brochure for a launcher was ready in time for the military cancellation7. The brochure was prepared by Saunders Roe and RAE, and the vehicle is called, rather optimistically, Black Prince. Its design is very conventional: Blue Streak as the first stage, a 54-inch Black Knight second stage, with the Gamma engine uprated to 25,000 lb thrust, and various configurations suggested for a third stage, depending on the mission. This would also use HTP and kerosene, with a small four chamber rocket motor, designated the PR.38, from Bristol Siddeley. This would mean that the upper stages would be about 1/10th of the vehicle weight – a distinctly inefficient design. The vehicle would have a first stage diameter of 10 ft; the upper stages 54 inch or 4% ft. It would be nearly 98 ft tall. But the brochure points up another flaw in the whole project. Different versions of the third stage were to be tailored to three specific missions: a low earth orbit of 300 nm ‘for experiments in stellar U. V. spectroscopy’, a 300/7000 nm orbit ‘enabling investigations of the Earth’s radiation belts to be undertaken’, and a 300/100,000 nm orbit for a ‘Space Probe’. Such imprecise missions do not engender confidence, nor answer the question: what was the point of Black Prince? prepared to raid the science budget, and there seemed no obvious other source of finance, unless the Treasury were to fund it over and above existing expenditure – which was highly unlikely! This is shown very clearly in a letter from Hailsham to Sandys (now Minister of Aviation) in April 1960, just after the announcement of the cancellation of Blue Streak as a military weapon. The Advisory Council on Scientific Policy said in its last report that to leave vital scientific needs unsatisfied ‘in order to shoulder the crippling cost of a large programme of space exploration on a purely national basis would be, in the Council’s view, the grossest folly.’ At that time, of course, we were going ahead with Blue Streak for military purposes and the Council said ‘we do not consider that the technological advantages likely to accrue from the development of a British rocket and satellite programme designed for civil purposes over and above the effects of the existing military missile programme, would be sufficient to justify the very considerable expenditure involved’. Using vehicles already developed for military purposes was one thing, but for the science budget to take on all the development costs of a launcher would be a very different matter. If Blue Streak had gone ahead as a military missile, then most of the development costs would have been covered by the defence budget, but that was no longer an option. Certainly the cost of the programme could not be justified from a very limited science budget. (b) 2nd firing – As above. (c) 3rd firing – Plus separation bay and dummy 2nd and 3rd stages. (d) 4th and 5th firings – As above. (e) In 1963 – 6th firing using live 2nd and 3rd stages plus a small simple satellite. In the event, not even the first flight had occurred by early 1964! The programme would involve firing three Blue Streak missiles of current design, three modified ones carrying dummy upper stages, and two complete three stage versions, making eight firings in all, extending from the first firing in mid 61 to the last in early 64 at about four monthly intervals. … [the] first missile on the launcher by April 61, static firing in July and first flight October 1961. Thereafter flights in March, July and October 1962 and 1963, terminating with the eighth flight in March 64. Flights one and two would be unmodified Blue Streaks; firings 3, 4, and 5 would carry dummy upper stages; firings 6, 7 and 8 real upper stages. In addition, the Black Knight plus third stage require firing from Area 5 [the Black Knight launch site at Woomera]. Three flights suggested between September 1962 and May 1963. The latter reference is to separate flight testing for the second stage. Thus the first complete vehicle would be F6 in March 1965. Senior civil servants are not noted for their extravagant use of language, yet in all the files that survive from the Cabinet Office and the Ministry of Aviation, no enthusiasm for the project ever shines through. Instead, Blue Streak, even in a civilian guise, is seen as an unfortunate inheritance from a military programme, and the very strong impression is that the project is maintained for political reasons rather than through any intrinsic merit. But to return to money: cost estimates for aerospace projects are a notorious minefield, and the launcher was to prove no exception. Hasty initial estimates gave £35 million.8 This was solely for vehicle development costs. But there would be other costs as well – the vehicles themselves (around £2 million each) and the satellites that would be carried. This pushed the total estimate up to £64 million by July – although this included in addition the cost of three satellites, which the early estimate did not. An analysis was also done of the unit cost of a launcher, once development was complete, and these estimates were in the region of £1.8-£2.1 million, depending on the number of launches per year. In total, the four year programme would cost £69.9m; the four year programme £73.3m. … the Ministry of Aviation… have very grave doubts about the five year programme on technical grounds. They are not at all sure that a firing every six months is in fact a viable arrangement. [ELDO managed only one launch a year between 1968 and 1971, with one gap lasting 16 months.] It would inevitably mean that many of the expert staff would be twiddling their thumbs for some time between each firing.
. the most that can be said is that the five year programme might put off by a year the (? evil) day when the scientists would be able to come along with their next big leap into space. The current BLUE STREAK programme will have run down to the level needed for the development of a satellite launcher by about the middle of July. A decision on the future of BLUE STREAK must therefore be taken within the next few weeks. (a) To cancel BLUE STREAK completely. (b) To undertake a programme of space research based on the joint Anglo/Australian development of BLUE STREAK as a satellite launcher. (c) To undertake a programme of space research as at (b) and to explore the possibilities of co-operative programmes with European and Commonwealth countries. (d) To take no final decision on space research, but to continue the development of BLUE STREAK at the minimum level while the possibilities of co-operation with Europe and the Commonwealth are explored. more than 2 or 3 months, since it would be unsatisfactory and uneconomic, and would prevent contractors from entering into the longer term commitments involved in the supply of materials. Contracts would probably have to be extended for at least 12 months. In practice course (d) would be difficult to present to Parliament and the public, particularly if it resulted in the abandonment of space research after a year or so. But, as we can see, course (d) is what the Government ended up with. Often a lack of any firm decision is worse than any of the decisions that could have been taken. Immediate cancellation would have saved money, pressing on with the project would have produced an end product. There was no room in the military budget despite Watkinson’s offer. There was little money for anything: the Ministry of Aviation had been given £50,000 for the initial design study for a satellite launcher, and they were told by the Treasury in April 1960 that if they want £250,000 for wider studies then they must apply for it. More realistically, Sir William Downey asked for another £35,000 in May. This is hardly an extravagant budget. In addition, money had to be provided for the ‘tick over’ contracts at the likes of de Havilland and Saunders Roe. So in May meetings began between RAE, Saunders Roe and Bristol Siddeley to continue the development of the design. Mention was made of an intention to ground launch the upper stages as part of the development programme. Saunders Roe set about the business of designing the second stage in detail and producing a test tank structure. De Havilland began the design of the interstage section, and Bristol Siddeley was keen to press on with the new engine for the third stage. Figure 58. The third stage of the proposed Blue Streak launcher (left), which would have been powered by the PR.38 motor (right). It has been decided that the proposed 3-stage satellite launching vehicle based on Blue Streak, Black Knight, and a third stage, and the subject of current project design studies, shall be known as the BLUE STREAK SATELLITE LAUNCHER. The names Black Prince and Blue Star, which have been used semi-officially, are not to be used. But even so, there was continued Government vacillation on the programme. The then Minister of Aviation, Peter Thorneycroft, had visited both Canada and Australia, and, as part of his mission, had attempted to interest both countries in a Commonwealth satellite launcher. High Down, the greatest diameter possible would have been 58 inches and Saunders Roe were asked to produce a design for such a stage. The third stage design is shown in Figure 58, with the PR.38 motor on the right. Some test chambers for the motor were constructed and fired, as can be seen in the photographs10 in Figure 59. However, the initial performance calculations for Black Prince gave a figure of around 1,750 lb in low Earth orbit. Communications satellites needed to be in a much higher orbit – preferably geosynchronous, although RAE and the Post Office had been interested in 8-hour and 12-hour orbits as alternatives. In addition, Woomera is poorly placed for launching such satellites, with its range restrictions necessary to prevent overflying of populated areas, and also too far south for geosynchronous launches. Estimates of the cost of an equatorial launch site were in the region of £20-30 million. Black Prince’s payload decreased rapidly with altitude and with launch direction: it was estimated that for a 2,500 nm orbit at 40°W of N, the payload was down to 600 lb.